ICC’s newly launched advanced training programme on drafting international contracts has proved successful, drawing a full house of legal practitioners, corporate counsel, sales managers and businesspeople involved in international trade to the inaugural session in Paris last week. Organized under the auspices of the ICC Institute of World Business Law, the practical training, held 7-10 October, attracted 40 participants from 22 countries. Training attendees took part in intensive working group sessions focused on negotiating and drafting a pre-contractual confidentiality agreement, specific clauses outlined in the term-sheet and negotiating and drafting a dispute resolution clause. The new advanced training Negotiating and drafting key clauses, dispute resolution, cultural and legal approaches, responds to demand for high-level contracts training taking an in-depth look at specific clauses. 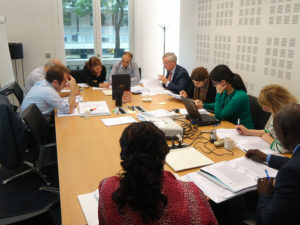 As well as imparting knowledge on how to manage cross-border contracts and finance international contracts, the training’s dynamic plenary sessions also aim to alert participants to common and potentially calamitous drafting mistakes while coaching them on how to recognize fraud and money laundering attempts. Led by international experts and held in an international and multicultural environment, the training culminated in a three-hour brainstorming session for participants to ask questions and seek recommendations on the problems they encounter in their daily work. ICC Institute Council Member Kristine Karsten chaired and moderated the training with brio. Ms Karsten also wrote the mock case and elaborated the training programme. Anyone interested in attending the ICC International Contracts training are advised to mark their diaries for future trainings scheduled to take place on 23-27 June 2014 (basic level) and 29 September – 2 October 2014 (advanced level).